Sound "Instantly recognizable increase in the space a recording throws into the room and an enriching of harmonic structure"; works with DVDs too. Features Includes all-synthetic polishing cloths, two small squeeze bottles of Auric Illuminator surface-treatment gel and an edge-marking pen. Use Two-step process is easy to do -- mark the disc's edges with the pen and then apply/buff the gel. Value Can effect changes that "people will pay hefty sums for" -- but you'll pay only $39.95. Here is another entry in the ever-questionable optical-disc treatment sweepstakes. The "bits is bits" crowd would have you believe that if a CD, laserdisc or DVD player can read the disc, then there is nothing you can do to the disc to improve the sound you hear. These people lose sight of the fact that the signal retrieved from CD or DVD is an analog signal, not digital. The signal from the disc does not become digital until it reaches the first IC on the main board, where the analog signal is converted from analog to bits for the first time. Because the signal exists in the analog domain for a period of time before conversion to digital, it is subject to all forms of analog noise. Static electricity fields and refractions at surface boundaries (air-to-disc and disc-to-air) could presumably alter the retrieved analog signal enough that there would be an audible effect on playback. There are probably a half-dozen or more different surface-treatment products for CDs and DVDs out there in high-end-audio land. You have to wonder how many of these products the market can or will support. I was a bit surprised to hear from the manufacturer of the Auric Illuminator system, Audience, about their product. It has been about two years since I last tried a new CD/DVD surface-treatment product, so the timing seemed to be reasonable. Besides, Audience was claiming that the Auric Illuminator produced more beneficial sonic improvements than other products, and that's a claim worth testing. The $39.95 kit includes a number of all-synthetic polishing cloths, two small squeeze bottles of Auric Illuminator surface-treatment gel and an edge-marking pen, which is to be used to paint the outer and inner edges of CDs and DVDs. My opinion of edge pens for CDs has waned over time. Years ago, I thought I was hearing a consistent improvement after painting edges with green pens, but the improvement was elusive at best and non-existent many times. As time went on, I noticed that there were lots of things you could do to make more obvious improvements that you could also get from edge-marking pens. What really hacked me off was learning that the used CD stores would not take my green-penned CDs in trade. The Auric Illuminator gel has the consistency of hand cream -- thick, creamy and slippery. Audience recommends treating both sides of each CD to minimize static buildup. You place two drops of Illuminator on one surface and smear it around until you cover the surface uniformly with the Auric gel. Then buff it off with one of the cloths. Audience claims that one kit will treat 200 to 400 CDs or DVDs, which comes to 10 to 20 cents per disc. I did some testing to find out if the Auric Illuminator system did more than the other surface treatments I had on hand, Reveal and a little bit of Finyl. Audience says you can wash off the Auric Illuminator gel with soap and water. I tried this and was able to restore the sound of CDs to their pre-treated condition. This permitted me to try the Auric Illuminator system, Reveal and Finyl on the same CDs, as Reveal and Finyl also wash off with soap and water. 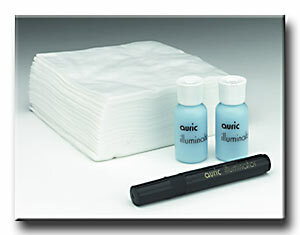 My initial impression was that Auric Illuminator did do more than other surface treatments for improving sound quality. (Reveal was second and Finyl third.) The general improvements I hear from optical surface treatment of CDs are an instantly recognizable increase in the space a recording throws into the room and an enriching of harmonic structure, which makes instruments sound more complete, accurate and mellow all at the same time. There is also a reduction in electronic edge and grayness, giving digital a more relaxing sound -- similar to the quality of LP playback. You dont need special CDs to hear what Auric Illuminator does. I used the following titles in my evaluation: Donovan From a Flower to a Garden [BGO label, UK import only], this is the folkie side of Donovan, different and better recorded than his hits; XTC Apple Venus [TWT Records 3250], bigger in scope than their previous albums; Ladysmith Black Mambazo Heavenly [Shanachie 64098], a cappella voice; John Hartford Good Old Boys [Rounder ROUN0462], contemporary acoustic folk-bluegrass. For improvement of sound quality, Auric Illuminator gets a definite thumbs up. The Auric Illuminator system was the best-sounding surface treatment on all of these CDs. Moving on to DVD, I performed very similar experiments, doing both image-quality and surround-sound evaluations to see if I could detect differences. I used the following DVDs for these evaluations: Austin Powers: The Spy Who Shagged Me, James Taylor: Live at the Beacon Theater, Cirque dSoleil: Quidam. In all three cases I observed distinct sonic improvements that followed the same pattern as the CD-audio improvements. The Auric Illuminator system gave the most pronounced improvement (Reveal second and Finyl third). I noted the same improved spaciousness and more complete harmonic structure to the music and sound. However, with the DVDs, it was easier to forget that I was listening to better sound. Perhaps the degree of improvement was a notch or two less obvious than with audio CDs, or perhaps I was just overly distracted by the video portion of each presentation that it was easier to forget the improved sound. Removing any of the surface treatments was definitely an exercise in "coming down," and I would probably use a surface treatment on DVDs even if the sound were the only thing improved. The Auric Illuminator improved image quality of DVDs to a rather surprising degree. My wife thought the transformation of Quidam was "pretty darn good." Yellow stage lighting became more golden and saturated -- warmer and richer, less hazy and more well defined from shadows to highlights. Blues probably changed the most. Some scenes in Quidam are heavily lit with blue stage lighting. Without surface treatment, the look of blue-lit objects was often hazy and dull. After surface treatment, there was a new "snap" to blue-lit objects. There was more detail, more dimension and a wider gamut of shades of blue. The many tiny overhead lights present in most shots in Quidam became tightly defined with a much-improved sense of being suspended in real dimensional space. Reds lost their tendency to block up and lose detail, and again there seemed to be more different shades of red visible, which gave images a much more real appearance. The Austin Powers and James Taylor discs were improved to the same degree as Quidam. It was quite easy to detect in playback systems that I was very familiar with. The scenes with psychedelic colors in Austin Powers were much more convincingly correct after surface treatment. Everything became more dimensional on both discs. Edge definition improves noticeably when you get up close to the screen. As you move back, you dont specifically see that edge-detail improvement, but you do see unmistakably better images. Little details that were subtle before become unmistakable after surface treatment. For 10 to 20 cents per disc, you get the kind of improvement in sound and image quality that people will pay hefty sums for. Although the degree of image and sound improvement offered by the Auric Illuminator system is considerably larger than subtle, it is a long way from huge. As always, I dont want to over-hype the degree. Cable and component changes often make improvements that are similar in degree to what I achieved with the Auric Illuminator system. If you only have $39.95 to spend but want a kick in the pants that offers images and sound as significant as a DVD-player upgrade, Audience's Auric Illuminator should be one of the first things you think about. If you already have a top-flight DVD player and other goodies, the Auric Illuminator will make them even better. The bottom line: Im applying the Auric Illuminator system to all my favorite and reference CDs and DVDs, and every new disc that comes in is going to get treated too. When you can spend this little and get this much, its like, "Duh?!"